Introduction: the thoracic empyema is defined as a purulent pleural effusion. Its most frequent cause is infectious parapneumonic effusion; however, postsurgical or posttraumatic empyema can also occur. The empyema has a progressive three-phase evolution and its treatment shall focus on the cause of the disease, the evolutionary phase and the general condition of the patient. In order to cure this condition, some cases require thoracotomy with open thoracic window drainage. Materials and Method: observational, retrospective and descriptive study based on a series of cases. We analyzed data from consecutive patients with empyema who underwent thoracotomy with open thoracic window drainage and using a negative pressure system in a third-level care hospital in the southeast of Mexico between October 2015 and June 2017. Results: we analyzed 6 cases. Median of age was 46 years (interquartile range 34-47), and 67% were male. The negative pressure system was placed during the postsurgical period, with a median of 6 days (interquartile range 5-7). The mean permanence time was 61 days (IQR 43-148). Finally, the length of hospital stay was 72 days (IQR 49-87). 67% of the cases had thoracic window closure and adequate lung expansion. Conclusions: in patients with chronic empyema, an integral therapy including thoracic window thoracotomy with a negative pressure system is an acceptable treatment strategy. More studies are required in order to ratify the results more objectively. Key words: Empyema; Thoracic window; Negative pressure system; Surgery. The thoracic empyema is defined by the presence of pus in the pleural space. It is a critical condition with mortality rates of up to 40%1. The common history for the development of empyema is pneumonia with parapneumonic effusion (PPE); however, it occurs frequently in postsurgical (surgeries involving the thorax or mediastinum) or posttraumatic (associated with the presence of coagulated hemothorax) scenarios2, 3. Some of the risk factors that increase the probability to develop an empyema are: old age, diabetes mellitus type 2, malnutrition, poor oral hygiene, cancer, etc.4. Although antibiotics are one of the basic pillars for the treatment of all the patients with PPE or empyema, the initial approach must be adjusted to the three-phase staging of the infectious process, thus taking into account the etiology and general condition of the patient5. Taking into account the current standards of care, every empyema must be evacuated from the moment of the diagnosis6. However, there are cases with an unfavourable clinical evolution that require surgery with pleural lavage and decortication via thoracotomy. Regardless of the surgery, there are special situations, such as tuberculosis sequelae, lung cancer or bronchial fistula, that prevent a suitable lung re-expansion; in these conditions we suggest an open drainage via thoracotomy (window or fenestration type)7. Apart from the surgical procedure, negative pressure systems have been incorporated in order to improve the process of debridement, accelerate the formation of granulation tissue and reduce morbidity. These systems have a low rate of complications and reduce the length of hospital stay8. However, there are few reports related to this integral technique9-19. The purpose of this study is to inform the results of a series of consecutive cases of patients with empyema who received open window drainage via thoracotomy and using a negative pressure system. Observational retrospective and descriptive study of a series of consecutive cases of patients with empyema who underwent thoracotomy with open thoracic window drainage in a third-level care hospital in the southeast of Mexico between October 2015 and June 2017. This study was approved by the Research and Research Ethics Committees of the Institution. Due to the retrospective nature of the study, it was not necessary to obtain a letter of informed consent. The confidentiality of the data to be encrypted in the main investigator’s computer was maintained at all times. For the analysis, we systematically obtained the following variables from every file: age, gender, time of evolution of the condition, history of previous thoracic surgeries, comorbidities, isolated microorganism and lung function values, particularly patients who underwent spirometry. It is important to underline that all the cases were treated simultaneously with negative pressure systems. In our hospital we have the Renasys® and V.A.C® systems. The decision on which system to use was taken according to hospital availability; also, its implementation was based on benefits published in previous reports18. We registered the following variables from each system: time to start after surgery, baseline and final pressure parameters, time of use, complications and success or failure in window closure. Statistical Analysis: Since the continuous numerical variables had an asymmetric distribution, they were described as median with interquartile range (IQR). Categorical variables were presented as frequency with percentages. Data analysis was carried out by means of the Microsoft Excel package, version 15.36, 2011. We included six patients, whose main information is presented in Table 1. 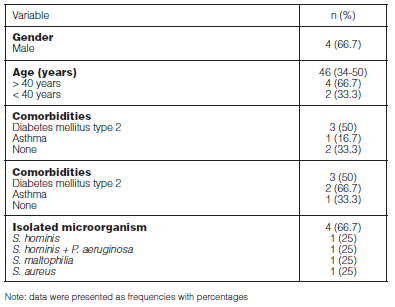 The median of age was 46 years old (IQR 34-47); 4 patients (67%) were male. The most frequent comorbidity was diabetes mellitus type 2 (50%); three patients had a history of thoracic surgery before they were referred to our center. Finally, the length of hospital stay was 71 days (IQR 49-87). Table 2 shows global results. Basing on the Eloesser technique, we performed resection of the 5th and 6th costal arcs in three cases and of the 6th and 7th costal arcs in the other three cases. The negative pressure system was placed in the postsurgical period with a median of 6 days (IQR 5-7), and replacements were made every 72 hours in a standardized manner. The median of pressure when the system began to be used was 50 mmHg (IQR 47-71); and the final parameters of pressure had a median of 100 mmHg (IQR 90-100). The time of use of the negative pressure system was 61 days (IQR 43-148), basing on clinical and radiologic evolution, and the existence of air leaks. Follow-up after discharge was ambulatory, with appointments every three days in order to replace the system. As regards the complications of the negative pressure system, one patient developed bronchospasm and another one presented bleeding (100 ml) through the pressure system. Finally, 67% of the cases experienced thoracic window closure with adequate lung expansion. It is worth mentioning that one patient had poor adherence to the medical indications and did not achieve thoracic closure, and another patient is still at follow-up due to bronchopleural fistula. The main findings of this study were: 1) 67% of patients treated with thoracic window via thoracotomy and negative pressure system had surgical wound closure; 2) two out of three patients had an adequate lung expansion; 3) among the cases with persistent infection and isolated germ, the combined therapy achieved total control of the infectious process; 4) there was a prolonged length of hospital stay. Previous reports have indicated that the combination of the thoracic window procedure with negative pressure systems is optimum for the management of patients with empyema that cannot be resolved through other management techniques6, 8. Closure and lung expansion rates are not reported in previously published series of cases, so, we are not able to conclude if the observed percentages correspond to the expectations or, in the best-case scenario, the use of negative pressure systems accelerates the process of closing the surgical wound. One aspect to underline was local control of the infection. The usefulness of the negative pressure system for the local control of serious infections has been reported before19. In our experience, the resolution of the infectious problem, confirmed by negative cultures at follow-up was achieved in every patient. In addition, we did not observe any clinical events after re-infection, maybe because we used closed suction systems manipulated by trained personnel, in accordance with the recommendations of the manufacturers. Outpatient follow-up allowed family members or caretakers to manipulate the system, thus favoring outpatient management of the system with satisfying results. The length of hospital stay and time of use of the device were greater than those reported in other series of cases. 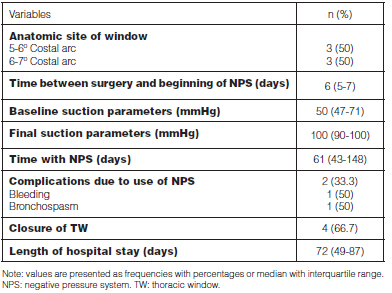 Palmen et al and Sziklavari et al report a median of time of hospital stay of less than 3 weeks and 1 – 2 months for the use of the negative pressure system10, 17. The complexity of the case is an important determinant14, among other factors, of hospital stay prolongation. Since our hospital center is considered as referential of the Mexican southeast area, the cases are admitted late (210 days, IQR 46-638). It is worth mentioning that the times correspond to the total number of days from the beginning of the condition until its resolution. Evidently, there are unjustified delays that force us to communicate our results in order to make the other centers aware of the need to refer patients early. Although some complications have been reported with the use of the negative pressure system, the percentages are not informed because they are related to case reports so we are not able to conclude if the complications observed in our series are associated with conventional expectations. The most frequent complications are: bronchopleural fistula, hemothorax and mediastinal shift, among others20. The complications in our study were bleeding not associated with hemothorax and bronchopleural fistula. The bleeding was corrected by re-adjusting the therapeutic parameters of the negative pressure system. This strategy derives from the information reported by Sziklavari et al, who used suction pressure levels of up to 125 mmHg without reporting leaks or bleeding at follow-up17. The bronchopleural fistula was corrected by placing a strip of plastic material on the fistulized lung tissue and then installing the negative pressure system, allowing us to carry out the treatment without complications. The limiting factors of our report are its retrospective nature and the series of cases of an occasional nature; however, it is normal to find in the literature reports of a case or series of similar cases since it this procedure entails very detailed indications. Likewise, we did not use a unique negative pressure system due to the availability of the resource in our hospital. We had the opportunity to use two systems, Renasys® and SensaT.R.A.C.™ Pad of the V.A.C® system. Both systems have advantages and disadvantages that we can›t confirm with this study; however, we can say that the SensaT.R.A.C.™Pad of the V.A.C® system has a sensor that identifies very little leaks and has interruptions that may delay the continuity of the treatment. In patients with chronic empyema, an integral therapy including thoracic window thoracotomy and a negative pressure system is an acceptable treatment strategy. It is mandatory to reinforce the reference system with better inter-institutional communication. More studies are required in order to ratify the results more objectively. 1. Reyes KG, Mason DP, Murthy SC, Su JW, Rice TW. Open window thoracostomy: modern update of an ancient operation. Thorac Cardiovasc Surg. 2010; 58(4): 220-224. 2. Abad-Santamaría N, Melchor-Íñiguez R, Izquierdo-Patrón M, Jara-Chinarro B, Jareño-Esteban JJ, de Miguel-Díez J, et al. Derrame pleural paraneumónico y empiema pleural. Rev Patol Respir. 2008; 11(3): 116-124. 3. Cortes-Telles A, Morales-Villanueva CE, Figueroa-Hurtado E. Hemotórax: etiología, diagnóstico, tratamiento y complicaciones. Rev Biomed. 2016; 27(3): 119-126. 4. Vega-Sánchez E, Che-Morales JL, Vargas-Mendoza GK, Manjarrez-Martin DA, Cortes-Telles A. Procalcitonina sérica como biomarcador diagnóstico de derrame paraneumónico o empiema. Neumol Cir Torax. 2017; 76(1): 7-13. 5. Pan H, He J, Shen J, Jiang L, Liang W, He J. A meta-analysis of video-assisted thoracoscopic decortication versus open thoracotomy decortication for patients with empyema. J Thorac Dis. 2017; 9(7): 2006-2014. 6. Light RW. Parapneumonic effusions and empyema. Proc Am Thorac Soc. 2006; 3(1): 75-80. 7. Charalampidis C, Youroukou A, Lazaridis G, Baka S, Mpoukovinas I, Karavasilis V, et al. Physiology of the pleural space. J Thorac Dis. 2015; 7(Suppl 1): S33-7. 8. Robledo-Ogazón F, Mier y Díaz J, Sánchez-Fernández P, Suárez-Moreno R, Vargas-Rivas A, Bojalil-Durán L. Uso del sistema de cierre asistido al vacío VAC en el tratamiento de las heridas quirúrgicas infectadas. Experiencia clínica. Cir Ciruj. 2006; 74(2): 107-113. 9. Munguia-Canales DA, Vargas-Mendoza GK, Alvarez-Bestoff G, Calderon-Abbo MC. Management of pleural empyema with a vacuum-assisted closure device and reconstruction of open thoracic window in a patient with liver cirrhosis. Arch Bronconeumol. 2013; 49(10): 447-449. 10. Palmen M, van Breugel HN, Geskes GG, van Belle A, Swennen JM, Drijkoningen AH, et al. Open window thoracostomy treatment of empyema is accelerated by vacuum-assisted closure. Ann Thorac Surg. 2009; 88(4): 1131-1136. 11. Hofmann HS, Schemm R, Grosser C, Szoke T, Sziklavari Z. Vacuum-assisted closure of pleural empyema without classic open-window thoracostomy. Ann Thorac Surg. 2012; 93(5): 1741-1742. 12. Begum SS, Papagiannopoulos K. The use of vacuum-assisted wound closure therapy in thoracic operations. Ann Thorac Surg. 2012; 94(6): 1835-1839. 13. Sziklavari Z, Ried M, Zeman F, Grosser C, Szoke T, Neu R, et al. Short-term and long-term outcomes of intrathoracic vacuum therapy of empyema in debilitated patients. J Cardiothorac Surg. 2016; 11(1): 148. 14. Sziklavari Z, Grosser C, Neu R, Schemm R, Kortner A, Szoke T, et al. Complex pleural empyema can be safely treated with vacuum-assisted closure. J Cardiothorac Surg. 2011; 6: 130. 15. Sziklavari Z, Ried M, Neu R, Schemm R, Grosser C, Szoke T, et al. Mini-open vacuum-assisted closure therapy with instillation for debilitated and septic patients with pleural empyema. Eur J Cardiothorac Surg. 2015; 48(2): e9-16. 16. Aru GM, Jew NB, Tribble CG, Merrill WH. Intrathoracic vacuum-assisted management of persistent and infected pleural spaces. Ann Thorac Surg. 2010; 90(1): 266-270. 17. Sziklavari Z, Grosser C, Neu R, Schemm R, Szoke T, Ried M, et al. Minimally invasive vacuum-assisted closure therapy in the management of complex pleural empyema. Interact Cardiovasc Thorac Surg. 2013; 17(1): 49-53. 18. Haghshenasskashani A, Rahnavardi M, Yan TD, McCaughan BC. Intrathoracic application of a vacuum-assisted closure device in managing pleural space infection after lung resection: is it an option? Interact Cardiovasc Thorac Surg. 2011; 13(2): 168-174. 19. Saadi A, Perentes JY, Gonzalez M, Tempia AC, Wang Y, Demartines N, et al. Vacuum-assisted closure device: a useful tool in the management of severe intrathoracic infections. Ann Thorac Surg. 2011; 91(5): 1582-1589. 20. Rocco G, Cecere C, La Rocca A, Martucci N, Salvi R, Passera E, et al. Caveats in using vacuum-assisted closure for post-pneumonectomy empyema. Eur J Cardiothorac Surg. 2012; 41(5): 1069-1071.